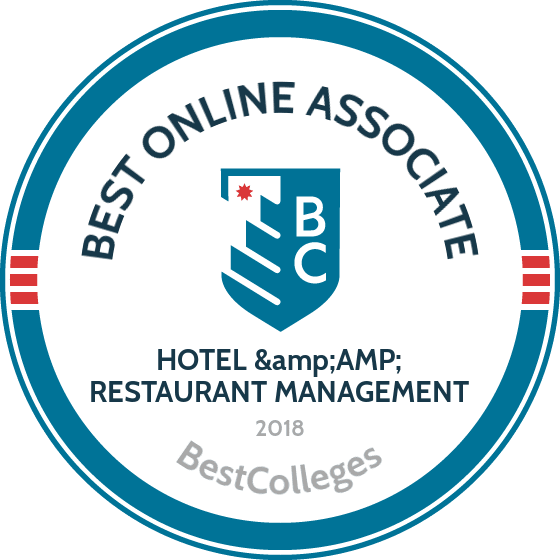 What Are The Best Online Associate in Hotel & Restaurant Management Programs? What Else Can I Expect From an Associate in Hotel & Restaurant Management Program? According to the Bureau of Labor Statistics (BLS), employment in the accommodation and food services sector grew by roughly 2.6 million jobs between 2010 and 2018. Talented individuals are needed to meet the demands of operating restaurants, hotels, and related businesses. Travel, tourism, and hospitality services alone employs one out of every eighteen Americans. In addition to a promising employment outlook, hospitality attracts college students for the enormous variety in careers and work environments, flexibility in scheduling, and opportunities for travel all around the world. An online associate degree in hotel and restaurant management can launch careers in this exciting and growing sector of the economy. Nassau Community College offers a hybrid associate degree in restaurant management. Students complete half of the 68 credit associate of applied science in food service administration, restaurant management online, and half on-campus in Garden, NY. The curriculum emphasizes hands-on skills, and graduates are prepared for mid-level positions in the food service and hospitality industries. The college -- which is a member of the State University New York system -- receives regional accreditation from the Middle States Commission on Higher Education. Prospective students must have earned a high school diploma or its equivalent and submit official transcripts. ACT or SAT scores are also required, along with an online application and immunization records. Nassau county residents pay discounted tuition. All other students pay the same tuition rate, irrespective of state residency. The college encourages every student to apply for financial aid by filing the FAFSA. Located in Joliet, IL, Joliet Junior College offers an associate degree in restaurant management online. The associate in applied science in culinary management curriculum is a 61 credit blend of academic courses and skills labs that place students in real-world management situations. Students develop skills in business, operations, management, and supervision, and explore pastry making, nutrition, food sanitation, and advanced culinary operations. Graduates are prepared to work as mid-level and upper-level restaurant and food industry managers. Applicants must show proof of a high school diploma, GED, or home schooling, along with official transcripts and official score reports from the SAT. Homeschooled candidates must submit attendance records and a letter explaining how their GPA was determined. Students who live in-district pay discounted tuition. Central Texas College’s associate degree in hotel and restaurant management takes four semesters -- approximately two years -- to complete, and students take between four and five three-credit classes per semester. The 60 credit associate of applied science with hotel management specialization degree explores topics in sanitation and safety, federal regulations, purchasing for hospitality operations, and marketing and sales. Most coursework lies within the hospitality major, though the program features four electives. Students complete the program with a three-credit internship or final project. Prospective students must file an application online or in-person at the Killeen campus. The college requires official high school transcripts or GED scores, ACT or SAT scores, and an immunization form. In-district students pay the lowest tuition, and Texas residents pay discounted tuition. The college encourages all students to file the FAFSA to determine financial aid eligibility. Macomb Community College in Warren, MI, offers a hands-on associate degree in restaurant management, taught by experienced chefs with decades of experience in the industry. The associate of applied science in restaurant management explores topics such as cooking sauces and soups, calculating the cost of ingredients, menu planning, and managing food safety. To develop and reinforce skills-based learning, Macomb has an on-site teaching restaurant. Students complete half of the 62 credit curriculum online and half on-campus. The program takes four semesters, or two years, of full-time study to complete. Applicants must have a high school diploma (or an equivalent) and submit official transcripts to the college. Prospective students then file a FAFSA and register for the college’s placement examination, which tests English and math. Macomb County residents pay the lowest tuition, while Michigan residents receive a discount. Students at the University of Northwestern Ohio can earn most of their hotel and restaurant management degree online. The associate of applied business in travel and hotel management degree program offers most of its 108 credits online, but students fulfill observational experiences at the university campus in Lima, OH, and participate in a three-credit capstone cruise. The curriculum is comprised of 32 credits of general education courses and 67 credits immersed in hotel management studies. Coursework explores topics that include customer service, cruises and tours, hospitality supervision, and resort management. Course sequences begin only in the fall. Prospective students must have finished high school or its equivalent and must provide transcripts. The university requires new applicants to submit to placement testing in English and math, however sufficiently high SAT scores substitute for this requirement. All online students pay the same flat per-credit tuition rate. Based in Brookline, MA, Newbury College offers a hybrid associate degree in hospitality and restaurant management. Coursework is available online and during evenings and weekends on-campus. The 64-credit associate of applied science in culinary arts curriculum takes two years to earn, including one summer semester of a culinary internship. Student explore the fundamentals of cooking and pastry making, nutrition, professionally maintaining the dining room, and classical versus contemporary cuisine and desserts. To ensure a well-rounded education, the curriculum also includes courses in algebra and foundational liberal arts. Applicants must submit a high school diploma and official transcripts; ACT or SAT scores are not required but are highly recommended. Similarly, a writing sample or letters of recommendation are also not required but highly encouraged. The college charges all students the same per-credit tuition. For over 35 years, Tompkins Cortland Community College has offered a bachelor’s in hotel and restaurant management associate’s degree. The Dryden, NY school places alumni into management positions all over the country, including famous institutions such as the Waldorf Astoria and The Cherokee Country Club of Atlanta. Students complete the associate of applied science in hotel and restaurant management as a hybrid of online and on-campus coursework, and benefit from the college’s local organic farm and renowned culinary center, located in downtown Ithaca. Tompkins is one of only a few colleges in the country to offer this distinctive farm-to-bistro concept. Applicants must have a high school diploma or submit GED scores. The college requires official transcripts. Once admitted, new students take placement exams before they can begin classes, and also complete an admission questionnaire and attend new student orientation. New York State residents pay discounted tuition. The associate in applied science in hotel and resort management at Finger Lakes Community College is a 64 credit degree that takes four semesters -- or approximately two years -- to complete. The curriculum is comprised of seven general education courses in subjects such as composition and occupational Spanish; 10 hospitality core courses covering hospitality law, financial accounting, marketing and sales, and hospitality law; and six courses on the resort and hotel management track. Students also complete an internship with a major hotel chain. Located in Canandaigua, NY, the college belongs to the State University New York system. Applicants must submit a high school diploma and official transcripts to the admissions office. Although New York State residents receive a tuition discount, the college encourages all students to file a FAFSA in order to determine financial aid eligibility. Newly admitted students are required to take placement exams before starting their studies. Saint Louis Community College, located in St. Louis, MO, offers a 64 credit associate degree in restaurant management. Known as the associate of applied science in culinary arts, the four-semester, two-year program explores intensive food preparation, the basics of baking, and introductory materials in hospitality management. The curriculum also features courses in college composition, mathematics, physical sciences, and oral communication, and concludes with a six-credit capstone. Applicants must submit their official high school transcripts to the registrar’s office, along with a FAFSA. After passing placement exams, new students plan the first semester with an academic advisor. District residents pay the lowest tuition rate. Missouri residents also receive a tuition discount. Among the many different online options available, it is important to choose one best suited to your career goals. Each program prioritizes a unique set of learning outcomes to prepare students for success. Hotel and restaurant management degree online curricula typically consist of general education courses alongside subjects specific to the major. Coursework offerings differ depending on your chosen school, but common courses are listed below. Event Planning: Suited to aspiring event planners, this course introduces the logistics of planning meetings, conferences, special occasions, and trade shows. Students learn how to secure venues, develop agendas and marketing materials, facilitate events, and work with varying timelines and budgets. Food and Beverage Management: This course explores management of a food and beverage establishment, including business plans and financing, legal considerations, kitchen operations, and customer service. Hospitality Law: This course explains civil law, contract law, hospitality enterprise structure, duties to employees and guests, crisis management, and federal agencies that oversee the industry. This broad subject area is useful for all hospitality careers, preparing students to manage establishments with compliance, ethics, and security in mind. How Long Does it Take to get an Online Associate in Hotel & Restaurant Management? To complete an associate degree in hotel and restaurant management, students typically complete 60 credits over two years, though the number of credits can vary depending on the program. Some programs offer students accelerated tracks or the opportunity to work at an individual pace. Students can also choose from programs with asynchronous or synchronous coursework. Synchronous courses, also known as a cohort model, use set schedules for courses. While cohorts benefit from positive relationship building, you may prefer individualized learning and the ability to complete coursework at a faster pace. Other factors that shorten the path to your degree include full-time or part-time enrollment and transfer credits. When exploring online schools, be sure to look out for regional, national, and program-specific accreditation. Accreditation ensures a program's quality, allows you to transfer credits between institutions, apply for federal funding or employee reimbursement, and sit for certification exams. Ultimately, accreditation indicates to future employers and four-year institutions you are a qualified candidate. Regionally accredited schools are often degree-granting, nonprofit, and/or public institutions, and follow more stringent academic standards. They are widely considered more prestigious. Nationally accredited schools tend to offer vocational or technical programs with less standardized, more specialized, and nonacademic emphases. Program-specific accreditation applies to one degree or program, but not to the university as a whole. The Commission for Accreditation of Hospitality Management Programs accredits hotel and restaurant management programs at the associate level. Across all programs, the Department of Education (ED) and Council for Higher Education Accreditation (CHEA) help regulate accrediting organizations. The ED maintains a public database of nationally recognized accrediting agencies. CHEA specifically recognizes regional, faith-related, career-related, and program-specific accrediting bodies and reports to the ED on emerging issues in quality assurance. You can find lists of all accredited schools in the U.S. on the ED and CHEA websites. What Can I Do With an Associate in Hotel & Restaurant Management Degree? After earning an associate in hotel and restaurant management degree online, you will be equipped with business acumen, communication and critical thinking skills, and competencies in financial analysis and loss prevention. Below are a few prospective careers you can pursue following graduation. Responsible for the smooth operation of food and beverage establishments, food service managers oversee business operations, employee performance, and customer satisfaction. They may also inspect supplies, manage budgets and payroll, and address complaints regarding food quality. Lodging managers ensure efficiency and profitability in running hotels and other accommodations. They focus primarily on meeting guest needs. Larger hotel chains may offer opportunities for advancement to regional management. These professionals organize all aspects of meetings and events, including weddings, conferences, and conventions. They may solicit bids from venues, monitor event activities, and plan the overall scope of events from start to finish. For those who do wish to continue their education, transferring to a bachelor's program is a popular stepping stone. Earning a higher degree in this field not only offers greater career diversity but also higher pay. According to the BLS, food service and lodging managers typically need bachelor's degrees. Hands-on experience can also help qualify you for senior management positions. Hospitality Business Management: Available as a standalone degree or as a concentration within a business major, students develop expertise in topics such as operations, sales, consulting, event planning, and service. Business Management: You can also branch out into a nonspecific business management degree. A bachelor's in business management teaches skills necessary for leadership, marketing, product management, and financial careers. Service Management: A bachelor's in service management prepares you for leadership in the hospitality industry through courses on business management, entrepreneurship, legal issues, customer service, and human resources. Concentrations include travel and tourism, food management, or hotel and resort management. The following PayScale data show salaries by experience level for jobs you can pursue with a hotel and restaurant management associate degree. For careers in the food and beverage industry, salary does not vary considerably with experience. PayScale also reports a majority of late-career hospitality workers have high levels of job satisfaction. In other fields, such as retail and event planning, years of experience affect your salary level. Certain skills may also lend themselves to higher pay; for example, as an event planner, you may earn more with relevant experience in budget management or contract negotiation. By joining a professional organization, you can meet and network with hospitality professionals and hear about career and professional development opportunities, internships, industry news, and continuing education programs. For opportunities most relevant to you, join an organization related to your future career. There are dozens of nationally recognized, field-specific organizations covering areas such as food and beverage, lodging, tourism, fitness and nutrition, and event planning, including the ones listed below. The NRA is the world's largest foodservice trade association, with 500,000 members. As a student member, you gain access to scholarships, free admittance to the renowned NRA show, and free and discounted research reports and educational materials. AHLA represents every segment of the hotel industry, from major chains to independent bed and breakfasts. Membership grants access to discounts on products, services, and events, members-only educational resources, and networking or advocacy opportunities. With more than 7,000 members across 37 countries, PCMA is the world's largest network of business event strategists. PCMA provides membership benefits such as volunteer leadership opportunities and early access to its annual event. Covering the cost of your associate degree in restaurant management is easy with so many financing options at your disposal, including tuition loans, scholarships, and grants. Some students also pay for their degree by working part-time. Loans and grants can come from private sources, like the above organizations, or the government. Completing the Free Application for Federal Student Aid (FAFSA) helps clarify the opportunities available to you.